The Portland City Council passed a Health Care for All-Oregon resolution brought forward by Commissioner Steve Novick (and thanks to the work of his policy staffer, Katie Novick) on Wednesday, October 19 after passionate testimony by HCAO health reform advocates and our legislative champion, Senator Michael Dembrow. With half the chamber filled with red “health care is a human right” t-shirts, the council heard from both scheduled speakers Dembrow, HCAO VP Ben Gerritz (also speaking for member organizations Cascade AIDS Project and SEIU) and Nancy Sullivan (Nurses for Single Payer). Dembrow outlined the progress of the Oregon Health Authority study on how to finance universal health care in Oregon from the HB 3260 (2013) enabling legislation to HB 2828 (2015) state financing to the current work by the Rand Corporation to be completed in November. Ben Gerritz eloquently expressed the struggle clients of Cascade AIDS experience in getting affordable health care. Nancy Sullivan cited her many years as a midwife and poor health outcomes for mothers and infants in the U.S.
A number of speakers, both HCAO advocates including Mary Lou Hennrich, former Executive Director of Care Oregon, Chris Lowe (Physicians for Responsibility), Jim Robison, Barbara Council and Charles Johnson, as well as others with health care horror stories, rounded out the hearing. The full hearing can be seen here from 22:27 to 1:11:09. Click on Oct 19 AM Work Session. The resolution language passed unanimously. 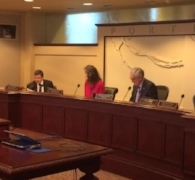 Read the Portland City Council resolution urging the legislature to create a transparent process to build a universal health care plan based on the Rand health care financing study.